Family cemeteries, no. 15: Henderson-Aldridge. | Scuffalong: Genealogy. Family cemeteries, no. 15: Henderson-Aldridge. – Scuffalong: Genealogy. Family cemeteries, no. 15: Henderson-Aldridge. There was another Aldridge cemetery, but its whereabouts are only vaguely remembered. Not far off Highway 117. A few miles north of Dudley. Robert Aldridge was buried there about 1899 and, presumably his wife Mary Eliza Balkcum Aldridge, too. There they remain, though others who died in that era were disinterred and moved to what is now known as the Henderson-Aldridge cemetery. 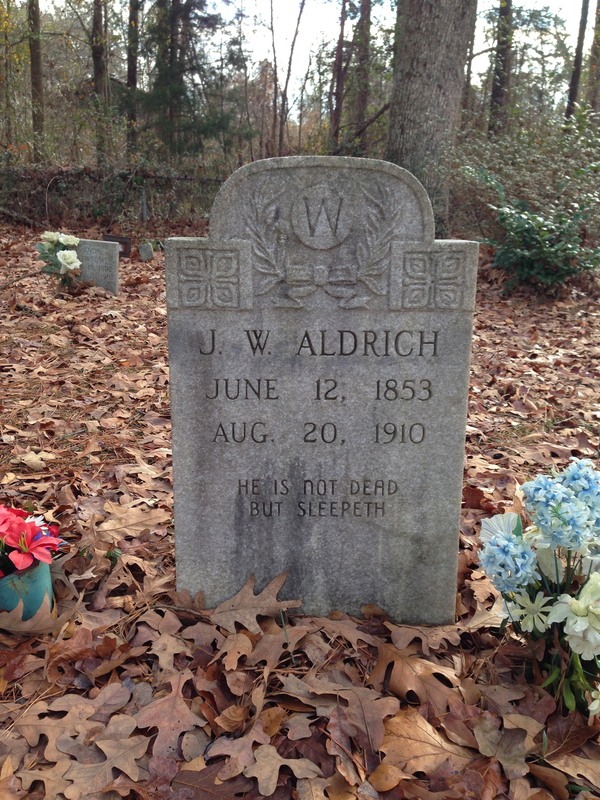 The oldest graves belong to Robert and Eliza’s son John W. Aldrich (1853-1910), his wife Vicey Artis Aldrich (1865-1927), and their daughters Lula Aldridge (1882-1918) and Amanda Aldridge Newsome. 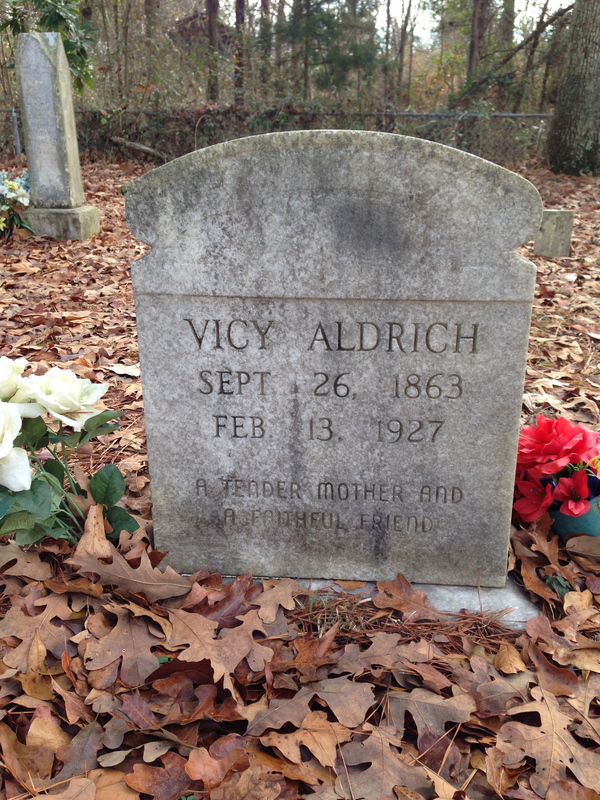 [“Aldrich” was the preferred spelling of son J. Thomas Aldrich, who erected the stones.] Most of the other graves belong to descendants of John and Vicey, or of John’s brother Robert Jr. and his offspring. Burials include Catherine Aldridge Davis (1900-2009) and her son George E. Davis (1921-1964); Lenora Henderson (1902-1961) and husband Henry Lee Henderson (1901-1942); Aaron H. Henderson (1922-1943); Horace B. Henderson (1923-1984) and wife Katie Lee Henderson (1924-1963); Hoover Aldridge (1929-1970); Dr. James T. Aldrich (1890-1968) and wife Athalia F. Aldrich; Frances Newsome (1883-1961); Allen Aldridge (1908-1969); Milford Aldridge (1913-1985); Sarah Eliza Aldridge Powell (1918-1998); Paul Aldridge (1913-1947) and wife Lonie Mae Aldridge (1919-1940); Robert Aldridge (1865-1941); Lula Aldridge (1882-1919); Amanda A. Newsome (1892-1918); Bennie R. Aldridge Jr. (1940-2008); and, most recently, Isaiah Len Henderson (1998-2013) and Ross M. Sutton (1935-2013). Photos by Lisa Y. Henderson, 2013. Thank you so much for this! I am a descendant of Lillie B. Artis. I have been following your blog for about a year and ever grateful that you do this work. Lillie, daughter of Adam T. and Amanda Aldridge Artis? Wow, great! I grew up in Wilson with descendants of several of Lillie’s full siblings. Thanks for following — and for the feedback. I’m always happy to “meet” new family and to know that the blog is helpful to others! — Lisa H.
The fallen leaves on the graves are beautiful, we don’t have falling leaves like that in New Zealand, lovely to see your pics! This is probably the first time ever that the scenery of little Dudley has gotten points over that of beautiful New Zealand! Thank you! 🙂 North Carolina doesn’t have majestic autumns like New England, but it’s a pretty time of year nonetheless. Pingback: Doctor slain. | Scuffalong: Genealogy.